Yesterday, I went to pay the rent to my landlady. During the conversation we had, she mentioned that there was a parade in the centre of Miraflores as part of the Fiestas Patrias, in which the Peruvians celebrate their independence from Spain. So, after lunch, I decided to go and watch the parade. There was a large crowd, many of whom were seated in the stands, specially erected for the occasion. No expense spared as it is a big occasion for the locals. I had to stand and wait for a long time, as the parade started an hour later than I had been told but the crowd waited eagerly and patiently. During the wait, small, national flags were distributed to the crowd, free of charge, which they waved enthusiastically. During the Fiestas Patrias, it is, apparently, compulsory to fly the national flag from all buildings. When the parade began, it was led by several Chinese style dragons (there is a fairly high percentage of Chinese people and those with Chinese ancestry, in Perú). I had been told previously that it seldom rains in Lima. So I was surprised to see that word of my presence in town must have spread, as the dancers seemed well prepared for the inevitable downpour of rain that accompanies me. 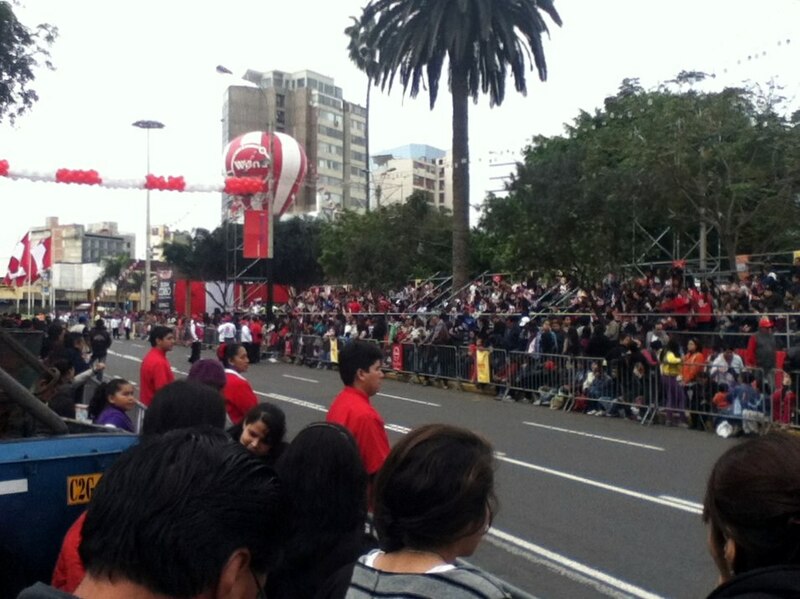 I was unable to stay for the whole parade, as I had plans for the evening. I did however, get a few photos of the early part of the procession. 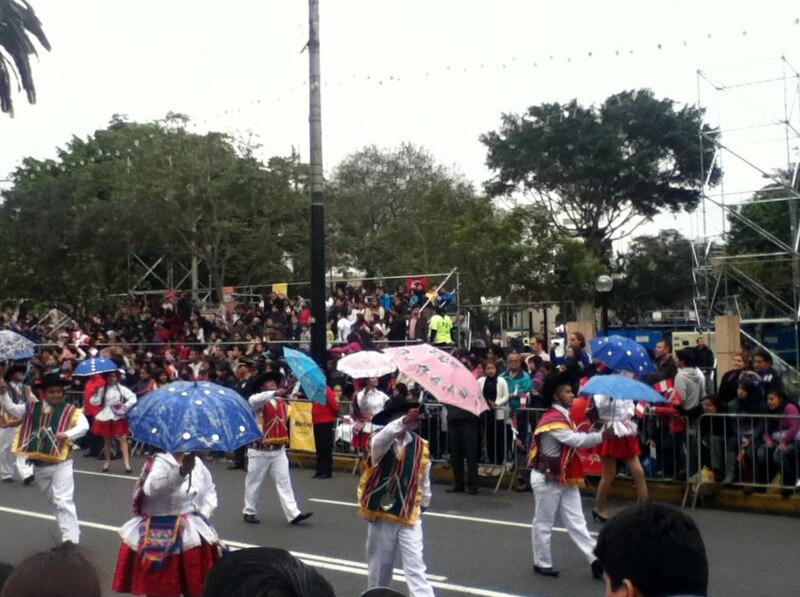 This entry was posted in Miscellaneous and tagged Fiesta Patrias, Lima, Peru, South America. Bookmark the permalink.